Easily one of the best documentaries of all time, GREY GARDENS, directed Albert and David Maysles, Ellen Hovde, and Muffie Meyer, premiered in 1975 at the New York Film Festival and went on to Cannes and Toronto the following year. In 2006, unused footage of Big and Little Edie was assembled into a follow-up film, THE BEALES OF GREY GARDENS, while HBO aired a narrative version of the film, starring Jessica Lange and Drew Barrymore, in 2009. GREY GARDENS is a must-see for any documentary fan, and especially for those who love cinema verité. 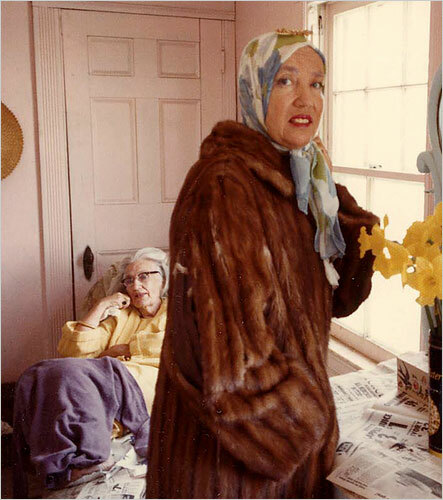 The filmmakers capture the Edith Bouvier Beale and her 56-year-old daughter Edie, close relatives of former US First Lady Jacqueline Kennedy Onassis, at their dilapidated East Hampton mansion, dubbed Grey Gardens, whose better days were long ago. Like their home, the reclusive Beales are viewed by many as past their prime, dwelling in reminiscences of better days as they bicker and keep each other company. A fascinating and poignant film about the complex relationship between mothers and daughters, and how living in the past many times makes one unable to cope with the present. If you’re in the NYC area, go to STF for a chance to see the film on the big screen, and for the post-screening Q&A with filmmakers Albert Maysles and Muffie Meyer. The previous night, the film will receive the inaugural Cinema Eye Honors Legacy Award.